This part-time master programme has a duration of two years. The current round started in September 2018 and will conclude in August 2020. The programme consists of four teaching modules and a master thesis module. 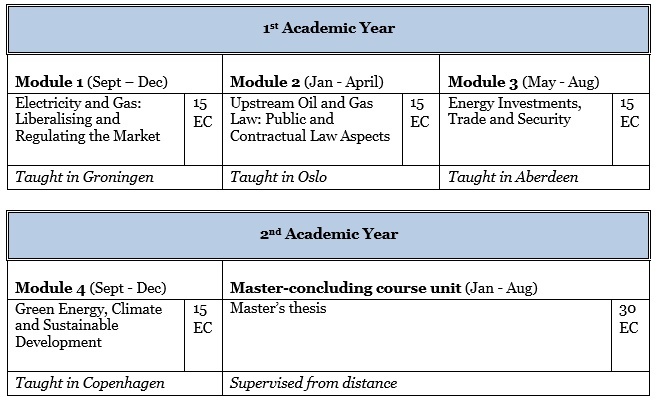 The study load is 90 European Credits (EC); each teaching module is 15 credits while the master thesis module is 30. One EC represents 28 hours of work. Given the independent nature of the teaching modules it is also possible to enroll for one (or more) single module(s). The image below shows the programme schedule in a diagram form, organised by Academic Year and Modules. Each of the four partner universities hosts one Teaching Module. After the Master Thesis is submitted, all graduating students will be presenting it in a symposium, at the occasion of their graduation ceremony (September year 2). The knowledge and skills gained by participants are assessed by papers and oral presentations. Participants submit a two-page bullet-point overview answering a set questions prior to the teaching period of each module and present their findings during a relevant lecture. The second paper (around 1500 words) is written during the two-week teaching period. All participants present their paper on the last Friday of the teaching module. After the conclusion of the teaching period, participants are required to write the longest paper of the three (7000-8000 words) and this paper carries the greatest weight towards the module grade (70%). The topics of the second and third papers must fall within the topics of the module and are free to be chosen by the participants. Upon admission all participants receive the relevant guidelines with detailed instructions, relevant guidance, and dates. Our unique teaching programme structure allows you to continue full-time employment and enables you to establish close relationships with your fellow participants and with lecturers during those concentrated teaching modules. Once the four teaching modules are completed, you will have time to write and submit a your master’s thesis using the knowledge and skills gained during the programme. The students are required to carry out independent scientific research. They will write their thesis under close supervision of one of the academics of the partner universities. The thesis of 30 EC is a part of the curriculum for those students wishing to complete the master course. The programme will be concluded by a symposium where participants present their master’s thesis. The presentation will not influence the grade of the thesis. The graduation ceremony will be combined with the symposium.The location of the symposium differs, and can be anywhere from The Hague to Greenland.